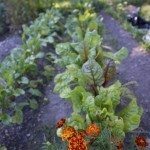 If you’ve noticed any unusual looking fruit or vegetable crops in the garden, then it is highly likely you are experiencing cole crop buttons or buttoning of stone fruits. This is especially true if you have had unseasonable weather or insect issues. So what is buttoning and what causes it? Continue reading to learn more about this phenomenon and how to fix plant buttoning in the garden. Buttoning is the result of stress, brought about by unfavorable weather or other reasons in both cole crop vegetables and stone fruit trees. Buttoning produces misshapen vegetables and fruits as well as stunted growth. Kale, Brussels sprouts, cauliflower, broccoli and cabbage are cool season vegetables known as cole crops. The word cole refers to stem and is not relative to the fact that these particular vegetables are tolerant of cold weather. Cole crop buttons are small heads that appear on plants that suffer from insect damage, drought, excessive salt, nitrogen shortage or severe weed competition. 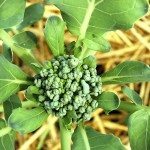 Buttons can develop on broccoli and cauliflower when they are exposed to very low temperatures. Cabbage is not so picky. Proper planting and care will help protect your plants from buttoning. Knowing how to fix plant buttoning by being prepared and carefully timing your plantings may save your crop. 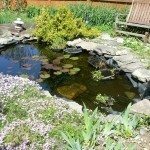 Top covering plants, if necessary, and providing a regular water and feeding schedule is also helpful. Stone fruits, such as peaches, nectarines, apricots, cherries and plums, need a certain number of cold days known as chilling units (CU) to produce fruit properly. When a stone fruit tree does not get enough chilling time, bloom is late and lasts longer than normal. There are other abnormalities in the pistil as well, with both pollen development and fruit set reduced. Buttons form in some varieties because of flowers that have set but never truly develop into viable fruit. The fruit ripens but is small and malformed or conjoined. Unfortunately, buttoning cannot be seen early in the season, so growers are unable to thin out the abnormal fruit. Buttons attract insects and promote disease over the winter months, so removal is the best option. Unfortunately, there is little you can do to prevent buttoning of stone fruits since it is more of a weather issue than anything else. When planting a stone fruit tree, make sure that the variety you choose will be able to get the proper amount of chilling during the winter months in your area.